The game of Composers features 52 music scores that represent many different kinds of vocal and instrumental music from the classical and romantic periods, usually the most well known examples of each type. 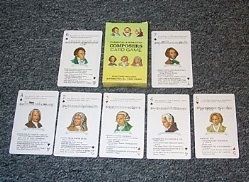 The game contains 52 cards, 13 books of 4 each. The object of the game is to obtain complete books by calling for cards from other players.